We’re getting Dewy Decimal headaches just looking at this thing. Welcome to the new ‘Eye of Binhai’ in Tianjin, China—1.2 million books, 5 storeys and thousands of stories (...ahhh, puns). Believe it or not, The Eye was built in just three years, which is about how long tradies have been working on our new patio extension. It’s a collaboration between the Tianjin Urban Planning and Design Institute and world-famous Dutch design firm MVRDV. The guys responsible for a 36,000 sq ft mural in Rotterdam and the world’s biggest scaffold staircase. 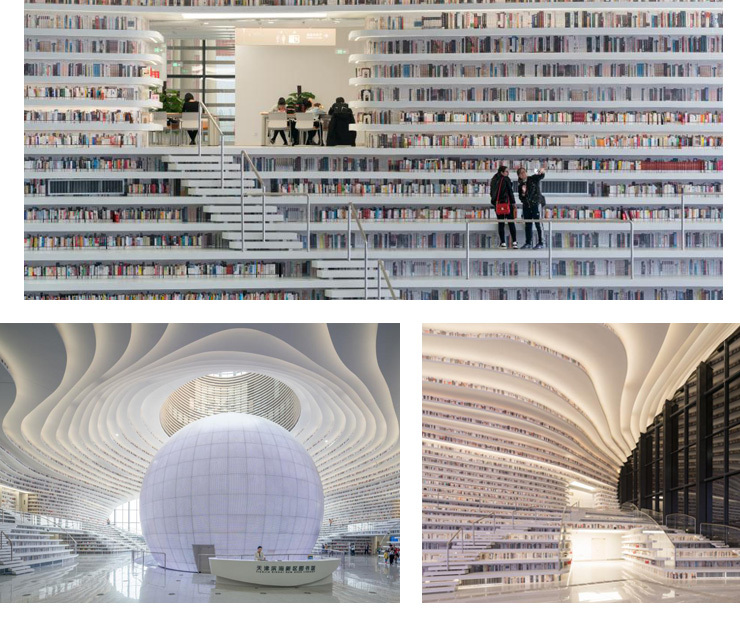 "The Tianjin Binhai Library interior is almost cave-like, a continuous bookshelf,” said Winy Maas, co-founder of MVRDV. “The angles and curves are meant to stimulate different uses of the space, such as reading, walking, meeting and discussing. Together they form the ‘eye’ of the building: to see and be seen." The new library’s got a huge reading area on the ground floor, lounges spaces throughout, plus offices and meetings rooms, twinked out with computers and audio gear. Oh yeah, and two rooftop gardens. The whole structure is anchored around a giant sphere, surrounded by curving bookcases. For more info on The Eye, you can check out MVRDV's website.